We’ve slashed our prices on a bunch of products for a June Sale. Let’s take a look at what’s on offer. All of our Pathfinder and Starfinder products are 33% off this week. This week’s Google Doodle inspired me to put Claustrophobia on sale too, so you can enjoy the game about garden gnomes in tight spaces. Offer ends Thursday. Halloween? Never heard of it. Not much happens on this side of the planet in October. Halloween isn’t a big thing—or even a thing—here. Right now, I’m enjoying the warmer weather that comes with Spring in October in the Southern Hemisphere. Soon I’ll be planning my December trip to the beach! That doesn’t mean we don’t have some amazing specials for your Halloween—however you choose to spend your October. Dying Dead: A murder mystery adventure with a twist—the murder victims are the undead! This is a 1-on-1 adventure for a 5th–7th level character. Chilling Curiosities—A Field Guide: A collection of new, horror themed creatures, compatible with the Pathfinder Roleplaying Game. Each monster is beautifully illustrated by Bob Storrar. Death Queen and the Life Stone: The first solo and 1-on-1 adventure in our Choose Your Destiny campaign, this one has plenty of spooky encounters to keep you enthralled. The second adventure, Forest of Secrets, written by David N. Ross, is out now. Keep an eye out for the Wolf of Heaven, a new werewolf race compatible with the fifth edition SRD, coming soon. I know, I know, I’ve been mostly been posting about sales lately. There are a few reasons for that, some personal, some professional, but all good. Unfortunately I’ve had to put blogging on the back burner for the mean while, but things will get back on track in time. For now though, another sale! Rising Phoenix Games is offering you a huge saving on Printed NPC Strategy Cards till October 10th. This is your chance to stock up on extra cards for your GM kit or as a gift for your GM buddies. Remember, the cards are compatible with a number of systems, you can read more by downloading the free PDF off the product page. Drive Thru RPG is running a massive sale on everything Savage Worlds. Check out their Savage September Sale to grab some great discounts. And hurry, there isn’t much time left. I’m Not Going to PaizoCon Sale! PaizoCon is just around the corner, but if you’re not going, don’t worry. The “I’m Not Going to PaizoCon Sale” is here. Two of our products are part of the sale, Lunatic Labyrinth and the Pewter Tankard Tavern. The sale runs through July 8th, so get some amazing savings now! Lunatic Labyrinth in play, using black and white laminated map tiles, which are included in the PDF. Miniature for scale, not included. I’ve seen the first draft of the cover design for Claustrophobia! and it looks amazing. Any time now I’ll be getting it back with more polish and then I’ll give you a sneak peak. If you don’t own the game yet, here’s your chance, a special discount on Claustrophobia! Get it while stocks last! I’ve been working on my own little solo/GMless game, and blogging about it right here, here and here. I’m offering you the chance to help me build an awesome game, which will work with D&D 4e and Pathfinder, so take a look and let me know what you think. Lastly, I’ve been fixing up the website. All this game designing and adventuring sure distracts me from doing a proper job of the home page, but it’s already improved and I have many plans to execute over the following weeks. Check it out here and let me know if there’s something you’d like to see. 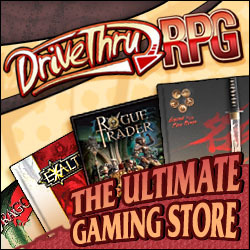 Drive Thru RPG is currently having a sale on Old School RPG’s. You can check out the sale here, and use this coupon code to get 15% off featured titles: OSRF711F2.